For many of us de-cluttering and cleaning our homes can go on all year round and is not just traditionally connected with Spring time. It is estimated that we spend approximately £10 – £20 per month on cleaning products which are predominantly used in the bathroom and kitchen that is equivalent to 4 bottles of wine or 2 – 4 family meals. -Grab a bottle of made cleaner? To help us save money throughout the year, and realising how much money we spend on cleaning products. It appears that we don’t need a cupboard full of shop bought products, but just a couple to clean our homes, which in turn can save us lots of money during the course of a year. 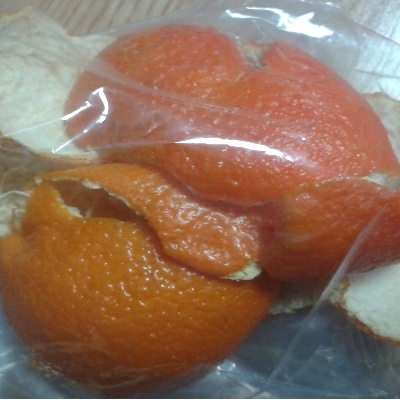 Orange peel saved in a plastic bag ready for use. – Apple Cider Vinegar (ACV) If you are being choosy, try an organic/raw and unfiltered variety. If you are planning to make a big batch of cleaner, keep the orange peel in a plastic bag in the fridge or freezer to keep fresh until you need it. Fill the jar with ACV ensuring that you cover the peel. Secure the lid tightly and place on the side of the worktop. Shake the jar daily to help release the oil from the skin of the orange into the ACV. Keep the liquid for at least 7 – 10 days before you use it. After the 7 – 10 pickling period has passed, strain the liquid into a spray bottle ready for use. 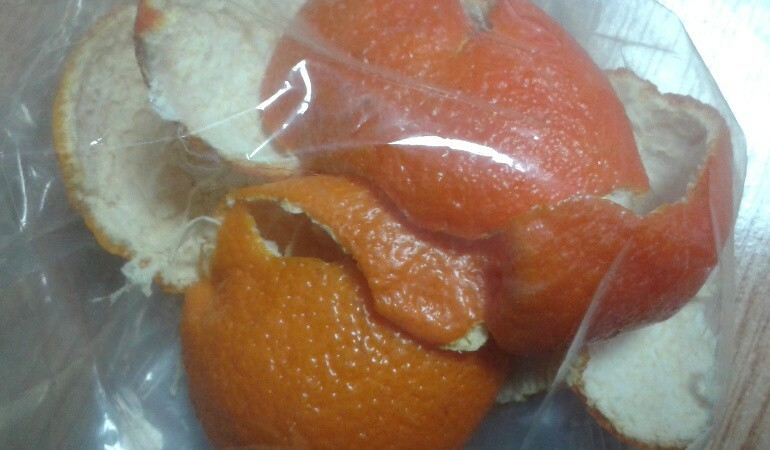 Throw away the orange peel. Cleaning solutions although made with natural products can still contain mild acids that can if you have sensitive skin, burn and sting the eyes. It is a good idea to wear rubber gloves and eye protection when cleaning very dirty areas, to protect your hands and eyes. Many people have their own preferred recipe for cleaning products, but if you would like to find out about other cleaning solutions, take a look at Keeperofthehome.org this site that can offer you alternative recipes for cleaning solutions around the home. What scented cleaning products will you make for your home, will they smell of oranges or lemons? If you have a favourite recipe or cleaning tip that you would like to share, we would love to hear from you.